MARATHON, Florida Keys -- A sub-adult, nearly 800-pound male manatee nicknamed “Coco” was released back to the wild Wednesday, hours after being rescued from a canal by members of the Florida Keys-based Dolphin Research Center Manatee Rescue Team. 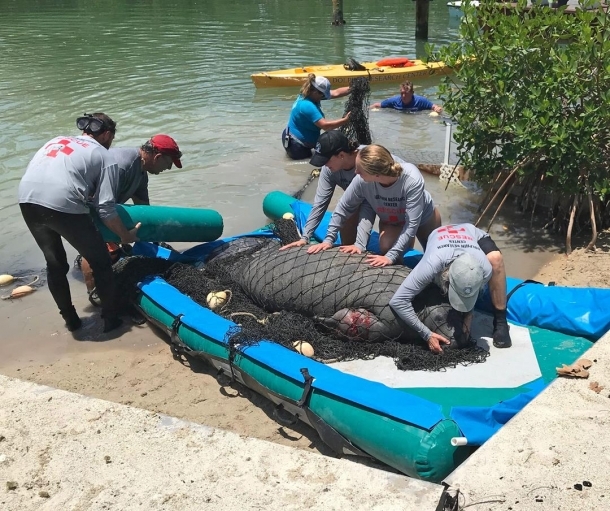 The group of marine mammal rescuers tended to the injured 9-foot-long manatee, whose front flippers had been entangled in monofilament fishing line. Veterinary specialists from the Miami Seaquarium, a manatee rehabilitation partner, helped to remove the deeply embedded line, treat “Coco’s” wounds with antibiotics and attach a microchip for future identification purposes. Over the last several days, sightings of the slow aquatic mammal in the residential area of Coco Plum were reported to the Florida Fish and Wildlife Conservation Commission. Successful release means the animal is functional and can survive on its own, demonstrating it can dive, stay submerged and forage for food such as water plants. The nonprofit DRC’s trained manatee assessors, rescuers and medical personnel are authorized by state and federal governments to respond to sick, injured or orphaned manatees when a call comes in from the FWC that one is in trouble. Personnel perform an on-site assessment of the animal’s condition and, if the manatee needs treatment, the DRC team.